It's about a hostile, abusive stalker who's in love with a girl, but can't come out and say it. Instead he's constantly calling her "ugly", "stupid", etc. as she laughs it off and puts up with everything he does. This is a comedy and it's funny and lovely. 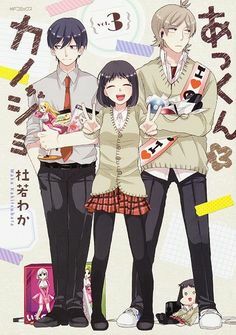 The main couple are Akkun Kagari (the boyfriend) and Non Katagiri (the girlfriend). Akkun's funny because he's so pathetic. He's the worst kind of abrasively brusque git, but he thinks Non is an angel, he worships everything she does and his bedroom is a stalker shrine. Watching him does things to your brain. At first, you'll think Non must be mentally deficient for not dumping him. Then, over time, you'll come to know him as she does and you'll start agreeing with her. His rudeness is idiot-speak for "I think you're a goddess, let me worship you". Ironically, we learn in later episodes that he'd love to be able to converse normally, for instance wishing for that at New Year. Every so often he'll accidentally show his affection and then have a reaction that lasts for days. She's like his minder. She watches over this poor, barely functional apology for a human being and finds him cute and adorable, as if he were a cardboard box of puppies. (It's because she understands him, by the way. She's not delusional, although she clearly got her very peculiar tastes from her parents. She thinks zombies are cute too and enjoys horror movies.) Meanwhile Akkun's the classical anime cliche of a tsundere, except male. They're fun. They're obviously made for each other and there's no way they'd ever let themselves be separated. However there are also two more couples, to: (a) counterpoint the show's themes, and (b) provide more jokes. This is what happens when a girl decides that she's in an Akkun situation, in defiance of all reality. Irie is lovely, unstoppably positive and deranged. She thinks Kubomaru-sensei's in love with her because he'll greet her in front of school (to scold her for being late), keeps her behind after everyone else has gone home (for make-up lessons after she's failed her tests yet again), etc. Kubomaru roughly understands what's going on, since Irie won't shut up about it, but he's a bit baffled because he keeps telling her she's wrong and she keeps hearing different messages in her head. Once the supporting cast got into things, I became terribly fond of this show. It's charming. You're cheering for Chiho-Matsuo and Irie-Kubomaru to get together and you don't mind that this would be the romantic equivalent of anti-gravity. They provide an uncertainty factor you don't get from Akkun and Non, who'll clearly be together for ever. With the supporting couples, though, will they or won't they? Will Chiho realise that her attempts at bullying the lamb-like Matsuo are instead making him proud and happy? (This can be very funny.) Will Kubomaru submit to non-stop pressure? That said, though, the Akkun-Non stability doesn't make their relationship static. Akkun's trying to move forwards. He wants to be nice to the girl he loves. You only glimpse it occasionally, but he's making genuine efforts in his cloth-eared way. Wholeheartedly recommended. I'm hoping they make a Season 2.